If search engines were to evolve into a 1 answer system? What best qualifies your page to serve up the 1 qualifying answer and result? SEO has evolved. Writers should understand that GOOGLE FRIENDLY is a preliminary step to being GOOGLE OPTIMIZED. The following chart shows how factors have evolved and continue to evolve. 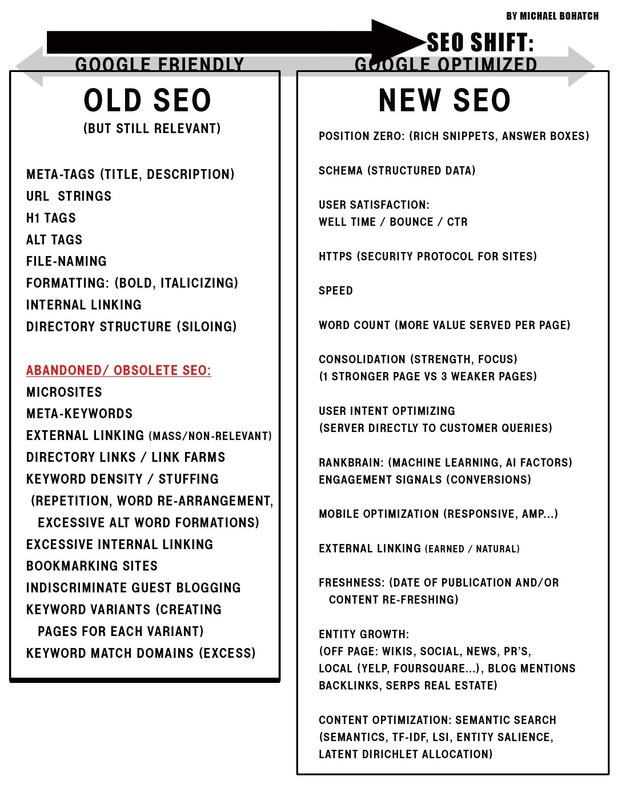 As a rule, core SEO tactics (older) should continue for GOOGLE FRIENDLINESS, future tactics should be used for (newer) GOOGLE OPTIMIZATION. Though combining these factors makes your page (and sites) a force to be reckoned with. The key takeaway is to familiarize yourself with these factors and incorporate this train of thought into your writing and page/site creations. Keywords are not an end-all or something to ignore, as they are pertinent to your content to users. What has changed is that content will not survive solely on keywords, (such as keywords in meta information, thin keyword-based content, or keyword repetition tactics). Content should be driven towards user intent and query satisfaction to rank as a best answer to the queries. Keywords should be collected & studied for relevancy and voice bringing value and comprehensiveness to your content as a cohesive theme. The following have been uncovered as prime contextual concepts being used for ranking the words on your page. These have been revealed per testing experiments, evidence produced, Google patents, and interviews (while not directly being communicated from Google itself). (Close natural language and variations of words instead of keyword repetition. The Co-occurrence of relative words) Example: canine images, puppy pictures, dog photos………. Relationships between phrases and words located in text (Ex: terms located in same paragraph may have closer relationship than those between text blocks) AKA: proximity of terms. If we want to rank well for “the rolling stones” it’s probably a really good idea to use words like “Mick Jagger,” “Keith Richards,” and “tour dates.” It’s also probably not super smart to use words like “rubies,” “emeralds,” “gemstones,” or the phrase “gathers no moss,” as these might confuse search engines (and visitors) as to the topic we’re covering. NOTE: If your page doesn’t offer the latest and greatest information, you’re probably not the best source to provide an answer to my question. Expect to rank accordingly. – Include the data that makes you relevant. Not just answer, but likely supporting information searchers may also be looking for. 8: Most Important Anchor Text? A study this year was conducted as to what form of anchor text link provides most value? This provides a road map into where you should be investing more time into. I have a tool that helps to speed up the information gathering process.